In this startling and informative book, which will appeal to both students and general readers, Goodall provides the first coherent new explanation of what sustainability actually is. Goodall then goes onto explore nine key sustainability challenges, applying the theory of sustainability to look at food, travel, clothing, electricity, heating and cooling, paper and cardboard, construction, consumer electronics, and air travel. 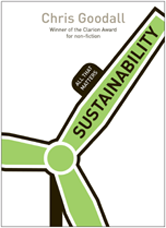 This accessible and concise book will appeal to both students and general readers, giving a challenging and thought-provoking introduction to sustainability - and what matters most about it. 2 Are we going to run out of anything?